Since Narendra Modi becomes Prime Minister of India, Narendra Modi government has lunched several schemes like Jan dhan yojana, atal pension yojana, LPG Subsidy, give up subsidy (campaign),Soil Health Card, Mudra Bank, Life insurance schemes, Make in india, swachch bharat, International yoga day and many more. So, here we are doing fact check of all the government schemes which are lunched by modi government, is it really a successful? Lets start with one by one and check each and every facts with deep analysis of each government project. A much needed government scheme was lunched by Modi government is "Pradhan Mantri Jan Dhan Yojana" in which, they targeted to give bank accounts to each and every person who don't have bank accounts. A Financial revolutionary scheme was lunched by Prime Minister Narendra Modi on 15th August, 2014 (From Lal Killa, delhi). In which, person can open bank account with just Zero Balance with minimum documents. Total Accounts Opened :- 19.34cr (11.78cr in Rural areas and 7.57 cr accounts in Urban Areas). Out of all accounts opened in Jan Dhan scheme, 15.14cr accounts opened in Public Sector Banks, 3.48 cr in Regional rural banks and 0.73cr in Private Banks. Verdict :- Jan Dhan Bank Account Yojana is Super Hit. (As on 25th November, 2015). Atal Pension Yojana was best pension scheme in which it gives provision that person will get minimum of Rs.5000 per month of Pension with 50% contribution of Government. This scheme is 50-50 partnership scheme where 50% (whatever amount invested by person, same amount )will be invested by govt. Out of total subscriber, 670704 are male subscriber and 428,167 are female subscriber of Atal pension Yoajana. Data Source :- http://www.jansuraksha.gov.in/ (reports) as on 27th November, 2015. Under Pradhan Mantri Suraksha Bima Yojana, any individual from age of 18 to 70 years can get Suraksha bima, Rs.2 lakh of life insurance for just Rs.12 per annum premium. Out of total subscriber, 56,335,400 are male subscriber and 35,350,154 are female subscriber of Pradhan Mantri Suraksha Bima Yojana. Total Claims answered under Pradhan Mantri Suraksha Bima Yojana :- 1673. As a part of Jan Suraksha Schemes (with Suraksha bima and atal pension) PM also lunched Pradhan Mantri Jeevan Jyoti Bima Yojana in which you can get Rs.2 lakh of accidental insurance for just Rs.330 per year of premium. Out of total subscriber, 17,958,107 are male subscriber and 10,628,067 are female subscriber of Pradhan Mantri Jeevan Jyoti Bima Yojana. Total Claims answered under Pradhan Mantri Jeevan Jyoti Bima Yojana :- 8279. Pahal (Pratyaksha Hastaantarit Laabh) or Direct Benefit Transfer Scheme for LPG subsidy is world's largest cash transfer programme which was registered in The Guinness Book of World Records. Under which, subsidy to each LPG cylinder subscriber was given directly transferred to their Bank accounts. Cash Given (in Rs. Cr.) : 23104. After the success of LPG Subsidy Direct Transfer scheme, Prime Minister Modi has urged people of india to give up subsidy (to those who can afford market price of cylinders). Total no of LPG Subscribers who Give up LPG Subsidy :- 51,12,474 (51 lac+ subscribers. Soil Health Card Program was dedicated to Indian farmers which help them to know their land (what corp will give them more revenue on particular land).The Soil Health Card is a printed report that will be given to farmers once in three years for each of his/her land holding. It will contain crucial information on macro nutrients in the soil, secondary nutrients, micro nutrients, and physical parameters. Verdict :- Need to Speed Up. An amazing initiative to "Fund the unfunded" person to start new business in india. Under Pradhan Mantri Mudra Bank Yojana, from Rs.50000 to Rs.10 lac of loan has been given to needed. Shishu, Kishor and Tarun, under these 3 categories loan has been given to people for Small Business Sector. Mudra Bank Yojana is helping indian economy a lot. Target :- Rs 1.22 lakh cr (By March 2016). 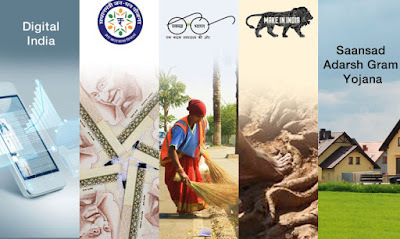 Swachch Bharat (Clean India) is not a Scheme or programm, its a movement started by india and govt of india. In which, it is targeted that all schools in india will have separate toilets for girls and boys. Also, it is targeted to build, individual household toilets,public & community toilets and waste processing units in all MLAs area. Launch date :- 2nd October, 2014. On June, 2015 India's all primary schools have separate toilets for boys and girls. - 100% Achieved. (80 lakh+ toilets are build in single year). Against the target of constructing 25 lakh household toilets in urban areas till March 2016, construction of 16.45 lakh toilets has been taken up and 4.65 lakh have already been built. Against the target of building 1 lakh toilet seats by March 2016, construction of 94,653 toilet seats has been taken up and 24,233 seats have already been built. PM Vidhya Lakshmi Karyakram was online campaign in which all the education loan and scholarship provider loans are tie up and a portal has been created from where students can apply for education and get aprooval online only. Also, single form for all banks, facility also been provided. Gold Monetization scheme is a unique scheme launched by government of india in which people india will get interest on deposit of gold to govt (which will be melted to meet future demand of gold in india). Also, govt lunched gold bonds and gold coins which will give annual interest to the people. As a part of Beti Bachao Beti Padhao, PM Modi has lunched a saving scheme, under which it gives 9.25% of annual interest rate on saving account. A natural/ legal guardian on behalf of a girl child can subscribe to this scheme and get 9.25% interest rate. No of Accounts opened in under Sukanya Samridhi scheme :- 1,44,329 accounts in Agra, 11lakh in tamil nadu, 30,000 in north east. The overall accounts opened under this scheme is above 1cr+. These are the fact check of each schemes lunched by Modi Government in past one and half year. Most of them are performing awesome or good (expect one). We will keep adding more government schemes and keep doing analysis. Keep reading us, Thank you.